In 1831 the Massachusetts Horticultural Society purchased 72 acres of mature woodland situated in Watertown and Cambridge for the creation of a “rural cemetery” and experimental garden. On September 24, 1831, a crowd gathered in the Dell, the natural amphitheater located in the heart of the Cemetery, for the ceremony to consecrate this sacred land. Newspapers described a crowd of more than 2,000 people who came from Boston and surrounding communities to participate in the dedication of the Cemetery–a burial place that might “be subservient to some of the highest purposes of religion and human duty.” Following the prayer offered by Henry Ware, a leading Unitarian minister and the Hollis Professor of Divinity at Harvard, the crowd of spectators joining in chorus to sing a new hymn written just for the occasion by Reverend John Pierpont. Joseph Story, an Associate Supreme Court Justice, the Dane Professor of Law at Harvard and Mount Auburn’s first president, then delivered the ceremony’s main address. The occasion which brings us together, has much in it calculated to awaken our sensibilities, and cast a solemnity over our thoughts.We are met to consecrate these grounds exclusively to the service and repose of the dead. The duty is not new; for it has been performed for countless millions. The scenery is not new; for the hill and the valley, the still, silent dell, and the deep forest, have often been devoted to the same pious purpose. But we address feelings intelligible to all nations, and common to all hearts. …It is to the living mourner – to the parent, weeping over his dear dead child – to the husband, dwelling in his own solitary desolation – to the widow, whose heart is broken by untimely sorrow – to the friend, who misses at every turn the presence of some kindred spirit. Thus, these repositories of the dead caution us, by their very silence, of our own frail and transitory being. They instruct us in the true value of life, and in its noble purposes, its duties, and its destination. They spread around us, in the reminiscences of the past, sources of pleasing, though melancholy reflection. We dwell with pious fondness on the characters and virtues of the departed; and, as time interposes its growing distances between us and them, we gather up, with more solicitude, the broken fragments of memory, and weave into our very hearts, the threads of their history. As we sit down by their graves, we seem to hear the tones of their affection, whispering in our ears. We listen to the voice of their wisdom, speaking in the depths of our souls. We shed our tears; but they are no longer the burning tears of agony. They relieve our drooping spirits. We return to the world, and we feel ourselves purer, and better, and wiser, from this communion with the dead. I grew up in Cambridge in the 1970s and often visited Mt. Auburn Cemetery, and every visit was profound. The beautiful variety of landscapes, plants, trees, ponds and trails somehow created an atmosphere of serenity. I happened to google Mt Auburn and read this amazing historical document. You did well to warn the reader that Story’s address came shortly after the death of his daughter: It’s pure and simple mind-blowing oratory from a time gone by, before radio. Story’s mesmerizing address was noble in its purpose. Hi Irene, Here is some more information about Washington Tower. Feel free to search ‘Washington Tower’ on our website to find more! Is there a book(s) on the cemetery – especially the horticulture, that I might be able to purchase prior to a visit next summer? 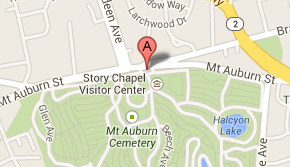 I know my relatives were buried at Mt Auburn, some before my birth. How can I trace their burial sites within the cemetery? Hi Nancy, you can use the grave search function our website: http://mountauburn.org/map/ Also on the page is more info about our geneaology and research request services. I hope you are able to find your relatives. An ancestor, Robert Chant, was buried in your cemetery in 1858 in what’s called a “corporation” plot. There is no marker. The census of 1850 describes him as being a “horticulturalist”. I’m wondering if he was an employee of the cemetery and do you have any employee records going back that far? Thanks so much. Dear Mr. Wilkinson, Thank you for your interest in Mount Auburn Cemetery. Unfortunately, we do not currently have access to our old employee records, as they are in fragile condition and stored off site. Our Research Docent, Stephen Pinkerton did a little research and found Mr. Chant listed as a horticulturist in historical records, but this area was rich in job opportunities for gardeners and arborists. The Cushing, Wentworth, Chenery and other big estates all had impressive botanical gardens, as did wealthy homeowners in West Cambridge and on Belmont Hill. There were also large nursery and food garden complexes in Alston, Brighton, and Belmont. Robert’s son Frank D. Chant was Belmont Chief of Police. Walking thru Mount Auburn Cemetery is one of my favorite past times. It is so beautiful and well kept. The historical aspect of the cemetery is such that it is difficult to comprehend how so many people in the area have never experienced the beauty within. Thank you John. We are so pleased that you enjoy walking at Mount Auburn! Happy New Year!